Becoming a Grammar Expert—Even If You Are Starting from Scratch! Many people, when they hear the word grammar, experience an increased heart rate, feelings of nausea, and uncontrollable sweating. When I tell people that I write grammar curriculum for a living, they often take an involuntary step backward and look as though they accidentally took a sip of the water they were using to grow alum crystals for their family’s latest science experiment. Perhaps grammar conjures up bad memories for you, or perhaps you love it more than chocolate. Either way, it can be a challenge to teach to your children. But don’t despair! You and your children can become grammar experts—and possibly even grammar lovers! In order to teach anything effectively, we have to understand its importance. Grammar is the language we use to discuss writing, and it provides the framework we need to understand how to craft our own writing and properly interpret the writing of others. Most people can cobble together a paragraph without any formal knowledge of grammar just as plenty of people manage to pull together a meal each evening without training in culinary arts. But if we want to consistently prepare delicious meals without mishaps, it helps to understand concepts like simmer, sauté, and steep. Likewise, if we want to take our writing to the next level (and correct our own errors), we need to understand the language and fundamentals of grammar. But understanding grammar doesn’t mean being able to find all the nouns in a sentence or circle all the adjectives on a worksheet page. It means understanding how all the parts of the sentence work together as a whole. If we look at grammar as a connected and unified picture of our language (or even of a foreign language), we get a sense of how it works and how it can help us become better writers and readers. So, how do we develop that understanding? We should always focus on grammar as a big picture. Instead of learning about nouns this week, verbs next week, and adjectives the next week, pull it all together. Delve into grammar at the sentence level by taking just one sentence at a time and really digging into it. Select very basic sentences for grammar novices and more complex ones for grammar virtuosos. Either way, study all components of grammar as they relate to that one sentence. I like to focus on the smaller parts of the sentence first (such as parts of speech) and work up to the bigger parts (such as clauses, sentence type, and diagramming) so my children can see the connections. We start our sentence-level study by identifying the part of speech of each word in the sentence. Once we know what the parts are, we look at how those parts are functioning in the sentence. In this second step, we identify and discuss concepts like subjects, predicates, objects, and phrases. After we have identified subjects and predicates, we can find the clauses and figure out the sentence type and purpose. Armed with this information, we consider punctuation and capitalization, talking about why certain words in our sentence are capitalized or why the sentence needs this particular punctuation. Finally, we diagram the sentence to see how all the parts connect. What if you don’t know all those concepts yourself? The best way to become an expert is to learn along with your children in this sentence-level analysis! Dig in together and discover the big picture. The conversations that result will help you and your children develop an understanding of and appreciation for the intricacies of language. As your students start to grasp the concepts, help them apply their new lingo. 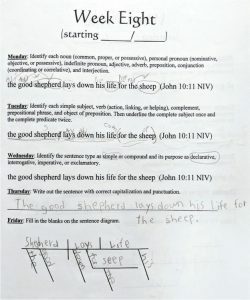 For example, students can write a new sentence modeled after the one they’ve just analyzed. When writing a paragraph or essay, students should incorporate the concepts they’ve been studying in their sentence analysis and point them out to you. Help your children use their understanding of grammar and sentence structure to correct errors in their writing, always focusing on why certain wording is grammatically wrong, right, or just more impactful. And apply the concepts to reading by finding examples of a particular sentence structure in a reading selection and discussing the author’s grammatical choices. As your children strive to become grammar experts, focus on these specific skills or skills that are appropriate for your family. Depending on your comfort level, you can be more or less specific in regard to each skill. 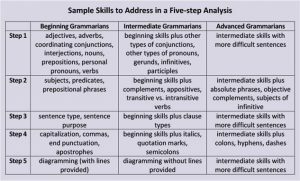 If you want a formal curriculum for grammar, look for one that focuses on connecting all the concepts at the sentence level. 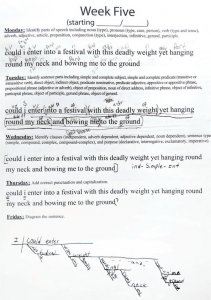 Avoid mindless exercises that deal with just one grammatical concept at a time. While these types of exercises may seem easier at first, they focus on fragmented skills and are therefore less likely to promote true understanding. Regardless of your previous grammar experiences or aversions, you can become a grammar expert and instill in your children a love for language. Just maintain a willingness to incorporate meaningful methods and a desire to learn along with them. Then trust God to bless your efforts! Copyright 2018, The Old Schoolhouse®. Used with permission. All rights reserved by the Author. Originally appeared in the Summer 2018 issue of The Old Schoolhouse® Magazine, the trade publication for homeschool moms.